Be the first to apply for the latest PA and temp job openings on your mobile anytime, anywhere. Never miss out on your dream job because you didn’t get round to it. Applying is easy. 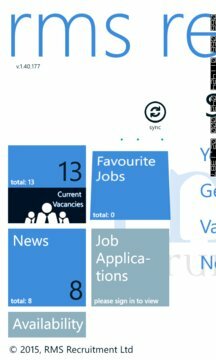 The RMS Recruitment app allows you to search and apply for jobs with the click of a button. Load up your CV or use your Linkedin account to register your interest. Set your preferences to make the app do your searching whilst you concentrate on other important distractions in your life. 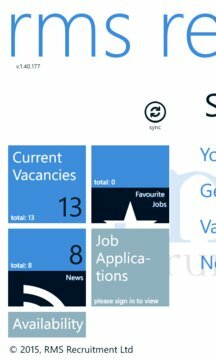 Use our search filters, to receive the latest jobs, temp jobs and perm jobs which sometimes get shortlisted within hours of coming in. Get help multi-tasking with a match to the right job and apply with a click whilst you’re out and about, in a meeting, on the other line, whatever your business, don’t miss out and let the other candidates get there first. Get up-to-date with the latest news and gossip from RMS who scout the web keeping abreast of changes which you should know about as a leader in your field. Keep at the top of your game with knowledge and tools which can help you gain multiple offers and secure the job you want. Download the app now and join the RMS network of candidates who help one another to find their dream job. If you’re looking for temp work; you can apply for a booking which sometimes get filled within 15 minutes of coming in; register your CV and send in your hours – all through the clicks on the app. Yes, it’s that simple. We recruit for industry favourites in fashion, finance, from boutique to bo peep, whoever it is, you can be assured that our clients have been vetted by our candidates, called in, checked out and checked up on by our savvy consultants who will not stop until they have found you the right role. Our app tracks your recommendations so that when we place a candidate or client you have recommended, it will send us a message and we will then send you the rewards you deserve. That’s £100 voucher and a lifetime membership to the RMS network. A home for you whenever you are looking for a job or looking to recruit your own staff.